Clean and wash well the leeks, using as much of the green as possible. Cut the leeks into half rounds, about 1/8 of an inch. Clean and wash scallions using the tender green part as much as possible, cut into 1/2-inch pieces. In a heavy, wide 3- to 4-quart casserole or pot, heat the olive oil over medium heat. Add the onions and shallots and cook them until golden, stirring often, about 8 minutes. Add the rice and stir to coat the rice with the oil. Toast the rice until the edges become translucent, 1 to 2 minutes. Pour in the wine and stir well until evaporated. 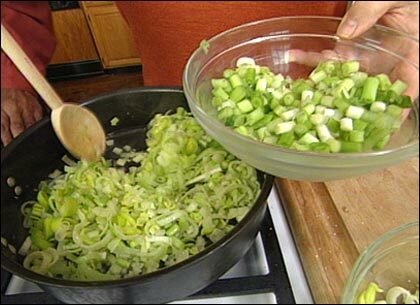 Add leeks and 1/2 cup of the hot stock and 1/2 teaspoon of the salt. Cook, stirring constantly, until all the stock has been absorbed. Continue to add hot stock in small batches — just enough to completely moisten the rice — and cook until each successive batch has been absorbed. In the last 5 minutes add the scallions. Stir constantly and adjust the level of heat so the rice is simmering very gently while adding the stock until the rice mixture is creamy but al dente. This will take 16 to 20 minutes from the time the wine was added. Just before taking off the heat, mix in the Gorgonzola. Remove the casserole from the heat. Stir in the butter until completely melted, then add half of the grated cheese. Adjust the seasoning with salt, if necessary, and pepper as desired. 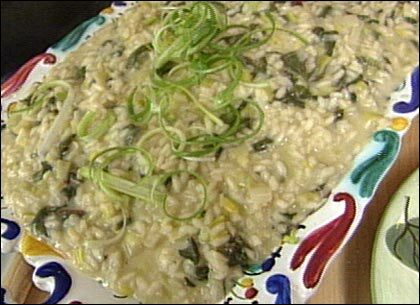 Top each serving with some of the remaining grated cheese and serve immediately, ladled into warm shallow bowls.